The display is sortable by permissions, list, type, name. Use the shift key to sort by multiple fields. Setting whether a contact should be displayed on your messages screen. Viewing own permissions and restrictions put in place by others. Keeping notes for each contact. Saving a note requires a Premium Account. Managing contacts in groups - changing permissions for multiple contacts by changing group permissions. Adding contacts to groups requires a Premium Account. : Same as by default, the contact is allowed to trade with your buildings and use any of your energy wells. Can be set to override restrictions of your alliance/faction contacts. : Counts as Foe in regards to trading with your buildings and using any of your energy wells, and as such cannot interact with any of them. : Counts as Friend in regards to accessing the services of your starbase, including protection and docking rights, and as such enjoys guaranteed access. : Counts as Foe in regards to accessing the services of your starbase, including protection and docking rights, and as such loses all access. : Counts as Friend in regards to squadron hiring, and as such may hire them at your starbase. 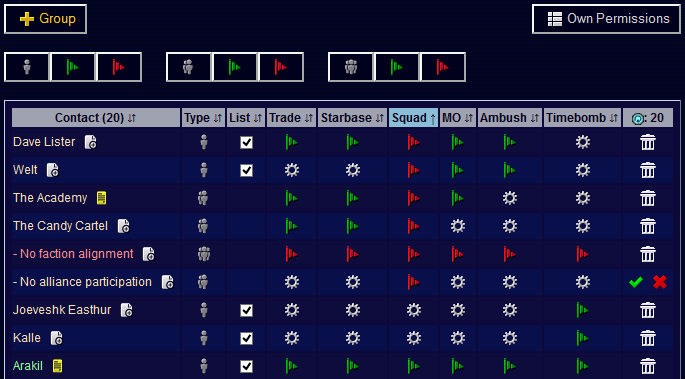 : Same as by default, the contact is restricted from hiring squadrons at your starbase. Can be set to override permissions of your alliance/faction contacts. : Counts as Friend in MO settings. : Counts as Foe in MO settings. : Counts as Friend in ambush settings. : Counts as Foe in ambush settings. : Same as by default, the contact does not trigger your timebombs. Can be set to override a trigger setting in your alliance/faction contacts. : Counts as Foe in regards to timebombs, and as such triggers them. Permitting all of the defined services is the same as putting a player on your friend list in the [MECH:Friends & Foes] screen. Similarly, restricting all services is the same as putting a player on your foe list. The wheel indicates the default setting, meaning no special permission or restriction is put in place. Adding and removing a player, as well as changing a player's permissions/restrictions results in a system message informing the player of the changes to their permissions/restrictions. In addition, Premium Account owners may save private notes for each of their contacts, each limited to 10,000 characters. These can be viewed even after the account downgraded to Free status. Premium Account owners may organize their contacts in groups. Groups are configured the same way contacts are and can contain any number of contacts (receiving the permissions of the group). If a group's permissions are changed, all of the group's contacts are updated. The AP cost is dependent on the amount of members, specifically amount * 10, as opposed to 20 APs to modify a single ungrouped contact. Contacts can be moved between groups (and the table of ungrouped contacts) by drag and drop. Other players do not receive any information about your groups, be it if they are in one or if you even use groups.